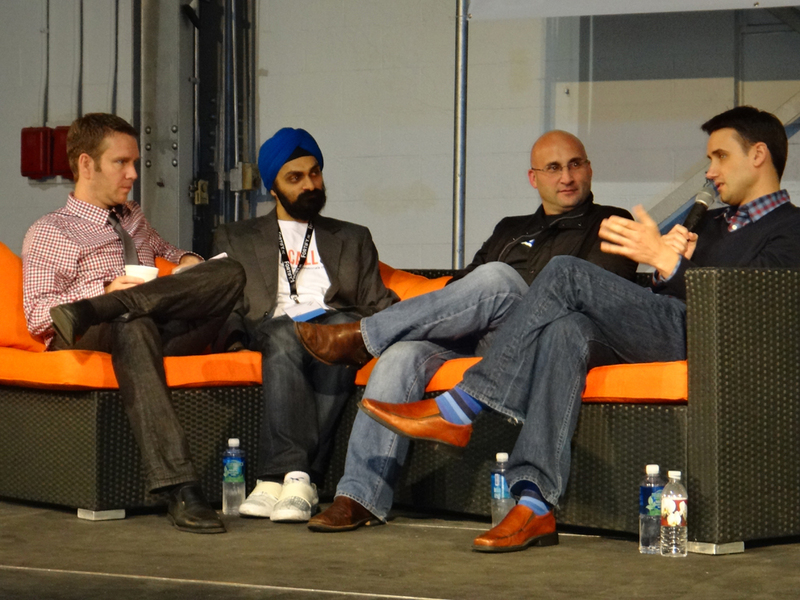 Being an entrepreneur is about, “The journey through the ‘NO’ to get to the YES’ ” said by Ryan Caldbeck, CEO of CircleUp, on a panel at the Connections Conference in Indianapolis. CircleUp is an online social marketplace that supports direct equity investments from individual investors to small private consumer and retail companies. He was talking about the history of VitaminWater and how the creator went through bankruptcy, had a failed marriage and spent years going from local mom n’ pop to mom n’ pop store trying to convince each one to carry Vitamin Water out of his car… eventually it went national as we all know. Being an entrepreneur is about making a commitment no matter how painfully difficult it is to keep it. The keynote speaker, other worldly magician David Blaine, shared his story how he had a dream of creating a real life interactive stunt. So this past October 2012, after years of investigative scientific research “Electrified” became a reality. 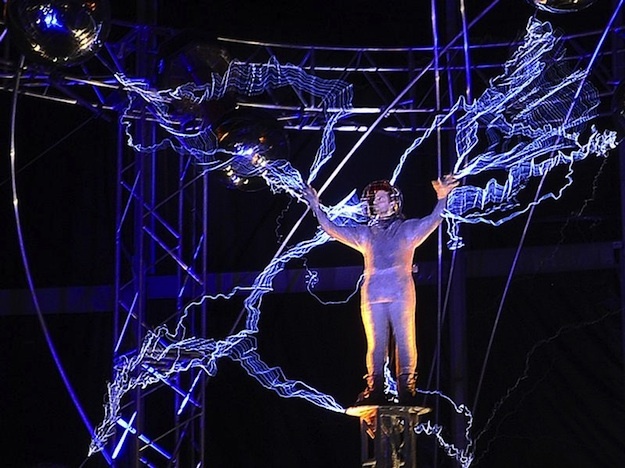 People could control electricity as he centered himself in a magic 8 type of globe. “A keyboard will appear during certain times that will allow me to interact with people all over the world,” Blaine told Mashable. “We are in a different age now where technology is so important and I wanted to be connected with people along the way.” Turns out all went wrong during the stunt; his catheter broke the first day so he couldn’t drink water in order to prevent needing to pee otherwise he’d be electrocuted, he started hallucinating due to sleep deprivation, and when he did use a small bit of water just to wet his lips the electricity caught the spit and shot right back to his body permanently damaging his heart. Despite every challenge he had to face he was determined to see his stunt through the end and not give up. He said that if it weren’t for his trusted friends who he knew believed in him and his vision he wouldn’t have been able to survive it. That’s what this article is about; how the impossible can be possible, but it takes a lot of perseverance and support to make it through the very difficult journey. Thanks to Matt Hunckler and his conference PowderKeg which collaborated with Connections, I discovered a whole city enthusiastic to support one another’s entrepreneurial endeavors – Indianapolis. This is where I met flourishing start ups, bankers, attorneys, local business neighbors and former Bay Area execs eager to empower one another right there in Indianapolis to achieve their dreams. PowderKeg was a huge endeavor for Matt to pull off, but he is so passionate about his city he couldn’t help, but undertake the huge financial, emotional and timely risk to host this conference, the first in the city to highlight local start ups. And when Matt asked his friends around the country for support people took action. I asked attendees who travelled from Los Angeles, Montreal, San Francisco, Washington DC, why they took the long flight and 3 days to attend PowderKeg and every answer was the same – Matt Hunckler. They said, “He’s gracious”. They said, “He’s passionate”. “He’s loyal”. “He’s inspiring.” “Plain and simple, he’s just a really great guy.” People believe in Matt and because of that they believed in his vision. In attendance were well-known founders, authors and investors such as Frank Gruber from TechCocktail, JonathonPerrelli from Fortify.vc, Liam Martin with Staff.com, Chris McCann who recently had his start up StartUpDigest acquired, Ryan Paugh of the YoungEntrepreneurCouncil(YEC), Scott Case from StartUpAmerica also part of the founding team at Priceline.com and JulienSmith who co-wrote the best selling book “TrustAgents” with Chris Brogan. We’re all so caught up in social media marketing and search engine optimization (SEO) that we tend to forget one on one relationships are the most powerful of them all. Word of mouth travels far. So what’s that mean to you and me… It means, the bigger ROI (return on investment) can be in correlation to having the best character. The big bad wolf doesn’t need to be the only winner. Sometimes Little Red Riding Hood is the champion. That brings me to Mike Coffey, partner of DeveloperTown, a wonderland there in Indy for programmers and nerds alike. When I first met Mike I thought this guy can’t be real; morals, integrity, compassion, charisma and a successful driven entrepreneur. I guess nice guys don’t finish last after all. Business heros who prioritize family and values can exist. His story…with the starting capital provided from some large angel investors in California he ran a fast growing business in the tech space, ended up growing into a multi million dollar company with two locations in less than two years. After riding the growing pains that come with a startup he took some time to focus on operations that were based in Indianapolis. After 3 months he knew that he needed to be based right next door to his customers in the midwest. He believed that Indianapolis, with it’s growing tech scene and startup incentives from the state, it would play the perfect role for his company but this was hard for his investors to understand. After a year of back and forth it was decided that they wanted him and the company back in California. This challenged his convictions and in end he requested to be bought out so he and his family could stay in Indiana. ” If there comes a time when you realize that you have all the responsibility but no power to lead, it’s better to let go and move on,” Coffey said. With no safety net in play, just peace in his heart, he stayed and let everyone he knew in Indy know that he believed in the city, the people, and growing tech scene. What really stood out to me is that he never stopped caring about those customers, even after moving on from that business, he still has them in mind. He consistently asks himself what he can do to deliver them value. He wasn’t in business just to make a quick buck, he was building genuine relationships. And now he continues to do so with DeveloperTown, taking young entrepreneurs under his wing to reach their highest potential. 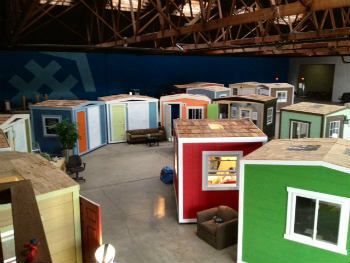 DeveloperTown is this awesome huge warehouse filled with mini houses that are offices developers work in. There are a sea of writeboard walls with rainbow scribbles of metrics and brainstorms. It’s spectacular and I want one here in Los Angeles. It’s most literally a town of quality start up developers. Amazing. 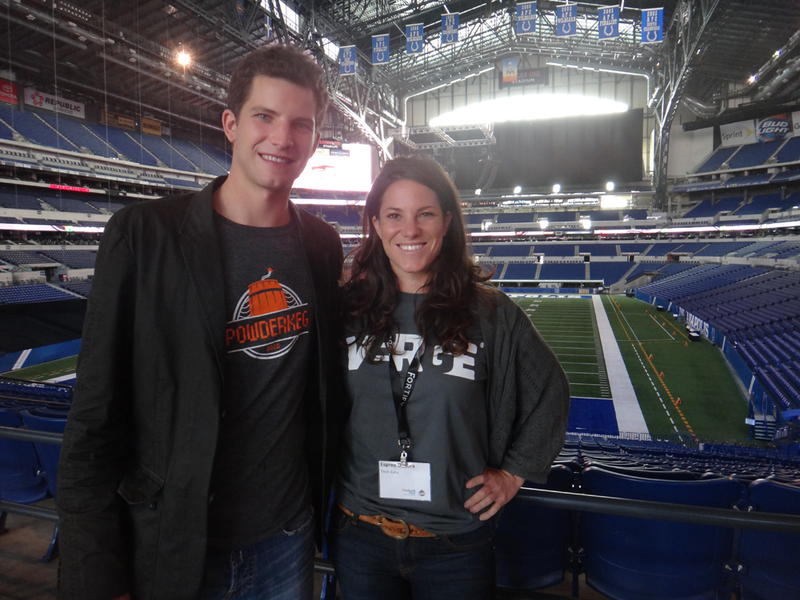 Tons of start ups demoed at PowderKeg’s StartUp Bowl held in the Lucas Oil Stadium famous for football’s SuperBowl XLVI. It was epic to be pitching a company from such a grand venue. CoatChex, ticketless technology for coat checking, known for turning down Mark Cuban’s investment offer on Shark Tank pitched, the founders of the photo sharing mobile app Bonfyre, who just weeks before had a booth at DEMO pitched, an incredibly profitable mobile app dominating in tourism, VisitApps, pitched. All in all people both from the area and those who travelled left PowderKeg thinking Indianapolis has more resource and connectivity for a start up than ever before. That quite possibly the supposed ‘need’ to move to the Bay Area to succeed in tech was finally dissipating.